Sprint has finally lowered its official asking price for Palm's webOS lineup. Effective today, the original Sprint Palm Pre drops to $49 and the Pixi is free after the usual rebates and contract discounts. These price adjustments come many months after other US carriers have lowered their comparatively better equipped Plus models to free. 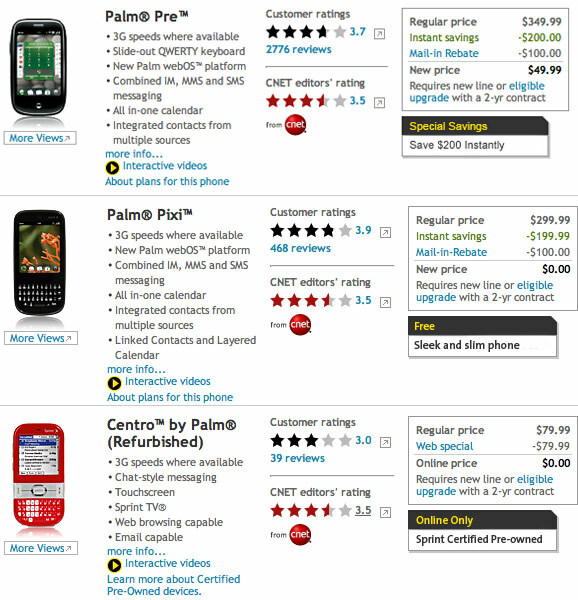 In related news, Sprint's web store is still offering the Palm Centro, also for free after a new plan and a web special rebate. A red refurbished model appears to be one of the last carrier supported Palm OS Garnet models available domestically. I am thinking about getting myself a Palm TX, I wonder if this would be a smart idea or not. Of course it depends on what I want to do with it. As a pure personal information manager this woud be a nice device. No platform is yet to match the power and simplicity of Palm OS. Nice photo viewing device if you use SD media swapping. As a web tablet or multimedia device etc, it is dark ages. A used gen1 Ipod Touch is light years ahead. Well you could just go into the Precentral forums and read up on, webOS Quickinstall, Homebrew, and overclocking and do it yourself. Once you get webOS Quickinstall running on your computer and Preware running on your phone, it's really quite easy to customize every single aspect of your Pre, including its speed. it's almost 2011. of course it's a dumb idea. but why stop there? maybe you should go back to a chisel and stone tablet? or maybe cave paintings. unbelievable.